So, where is John Lloyd Beach State Park? You can find this exquisite park in all its glory way down in southeast Florida in the city of Hollywood. 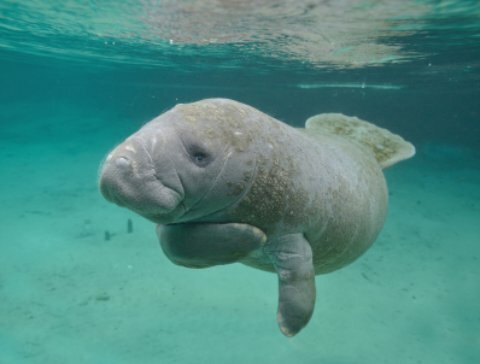 This park offers an incredible experience of observing manatees at Whiskey Creek, a manatee sanctuary. You will fall in love with these gentle, gigantic aquatic creatures with no neck and no waist. I had an immediate flashback to trying on swimsuits a few days earlier but once over the resemblance, I adored them. This park also has over 10,000 turtle hatchings a year and if you are lucky and are here in the early summer you can observe part of this process. The rangers offer an educational program where you will learn all about these small ancient dinosaurs. If it is hatching time, the rangers will give you a tour and let you see turtles lumbering back and forth from the sea to their nests where baby turtles are breaking open the shells of their incarceration and getting a glimpse of the world for the first time. I observed one little hatchling break free of his shell, raise his head to get a peek of the white sandy beach, sparkling water and sunny warmth and then he tucked his head under and nestled down for a nap. I guess birthing yourself is hard work. Also known as Lloyd Beach, the park has one of the most simple shore dives in the area for scuba diving and snorkeling. Check out Dania Beach while you are here, walk the famous pier so you can tell everyone you did and watch the world's fastest ball sport known as Jai-Alai. Concessions stand with gifts and snack bar, picnic tables, playground, restroom facilities and showers. Large picnic pavilions available upon reservation for a fee. What to do there. While in Dania Beach (where the park is located), have some more fun- Take a ride on the Dania Beach Hurricane, a roller coaster ride that the kids will love! Delicious finds: The kids will just love to devour a treat at Jaxson’s Ice Cream Parlor, or check out Tarks of Dania Beach for some affordable and great tasting seafood. Sleep tight at Cambria Suites where you can sleep in comfort and enjoy an inexpensive breakfast buffet.